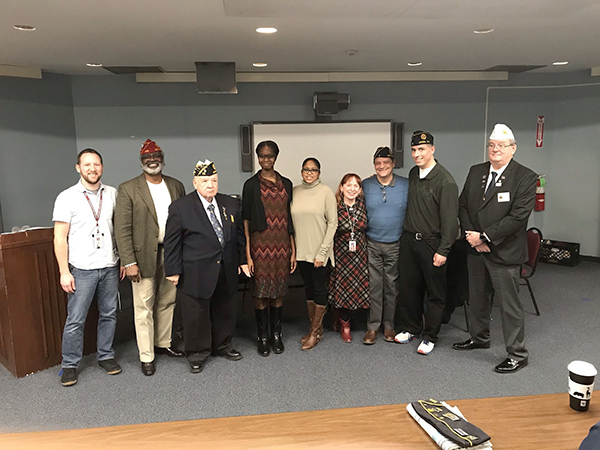 The second round of the National American Legion Oratorical Contest was held at Union High School on Saturday, January 12, 2019. It was a nailbiter as both finalists were excellent speakers. Union High School 11th grade student, Ayokunnumi (Faithful) Oluwakuyide, finished first and will now proceed to the regional contest in Branchville, New Jersey on February 10. If she is successful, Faithful will move on to the state finals. Faithful won the second round of the Oratorical contest against a student from Kent Place who was third in the state last year. She was supported by Mrs. Althea Bossard, Acting Principal of Union High School and Co-Coordinators, Sandra Mangarella and Jonathan Tumillo, English teachers at Union High School. ” We are all so proud of her!” Ms. Bossard shared. For more information on the contest, you can visit .legion.org/oratorical.